As we all know there are a lot of fish finder products and it is doing various tasks. If you are like fishing then you need to buy all the tools before you start your hobby, Humminbird 998c Si is one of the best product you should buy before start your fishing life because this product helps save your time and many things when you were fishing in the river or sea. Read the article, and you will find a lot of facts and important notes about Humminbird 998c Si Reviews. Why do we need to buy Humminbird 998c Si? The product is awesome, and it’s coming with amazing features. Humminbird 998c Si has, and it helps to get more things as in details. It is LCD 8 inch display and super bright color display. The display is really clear, and it is work very well in the harsh sunlight time too. So you do not need a cover display to watch the facts. You can enjoy your nightlife excursions with use of the CCFL backlight. It is coming with an easy navigation button system, and you can use it quickly in the fishing times. Dual card reader and instant preset buttons help you to operate this effectively. The product has fish eye view, and it helps to get an idea about what happening below your boat. As you know, it is fantastic features if you are amateur to the fishing hobby. Not only that, you can get 5 preset views. SIDE IMAGING SONAR, DOWN IMAGING SONAR, DUAL BEAM PLUS SONAR, SWITCH FIRE Sonar, and many more features are there. We will elaborate it below for you. SIDE IMAGING SONAR – side imaging helps to gain a 180 view below the surface. DOWN IMAGING SONAR – down imaging helps to get a fisheye view under the surface quickly. SWITCH FIRE Sonar – Switch fire helps to take control of how your sonar returns appear with Clear and Max mode. Humminbird 998c Si Manual – How To Use? What is Hummingbirds side imaging? Hummingbirds side imaging sonar is a revolutionary sonar technology that makes your time on the water more productive, unlike typical sonar which looks straight down below the boat. Side imaging sonar uses a razor-thin beam that projects up to 240 feet to both sides of the boat for 480 feet of coverage across the bottom. They look like photos these are sonar images and are not dependent on light darkness or even mud and silt will not interfere with side imaging original structure submerged wreckage boat automobiles. Even schools of baitfish show up in hummingbirds side imaging sonar returns. Besides, you can run your hummingbird in fresh or saltwater in depth as shallow as 2 to 3 feet. The image generated by hummingbirds side imaging may look daunting at first. But by understanding a few simple principles, you’ll quickly grasp everything. This powerful tool is showing you unlike traditional sonar side imaging moves from top to bottom instead of right to left. The most recent images will be at the top of the screen with your history Moving towards the bottom, your boat location is top center of the image. Let’s focus on the water column to give you a better idea of what’s going on with the hummingbird side imaging screen. We’re going to hold the image down the middle. Now we can identify the water column directly below the boat. Humminbird 998c Si software update. All hummingbird products are coming with high technology, and it is easy to use even if have no experience fishing tool 998C si interface is fantastic and it is user-friendly to the user. If you are an angler, then this item is a cool product to your daily fishing tasks because it has HD quality LCD screen plus well-sized font/digit view as well as feet manual for the user. How to update software and keep it latest technology? As we noticed we were found a lot of users, who suffer from update problems. If you visit fishing related forums, you also can see it is a significant matter and can found magnificent Humminbird 998c Si Reviews. So here are the steps if you are facing any problems regarding updates. 01. Restore the menu as back to factory default mode. 02. Keep in your mind, and you should do the first step before installing the updated version. 03. After setup factory default mode, installing update file and still have your problem then follow next steps. 05. Don’t forget, first you need to export your all Nav Data before starting this job. Humminbird 998c Si is the most trending product in 2019, and it is a premium tool on the market. You can use this great product as a portable or fixed type because it is a waterproofed unit. So you can use it as a portable product if you need. Item weight is 4.08 pounds. The latest technology and applications are almost included for this product, such as GPS receiver, GPS Tracking, GPS Chart plotting, etc. The Humminbird 998C Si has up to 8000w of PTP power output. 01. The product is tiny and easy to use. No need struggle to install it to your boat. 02. User-friendly interface and soft touch button help to use more efficiently. 03. The product is coming with dual SD card slots. That helps you to install a lot of images, video recordings and many more things for future use. 04. Anyone can update the software easily when it releases. 01. The HD LCD screen can get easily smudged, and this is the major problem of this tool. Even though you can be fixed it quickly using a screen protector. 02. The product price is a little bit high, and it may be a slight problem for casual hunter. 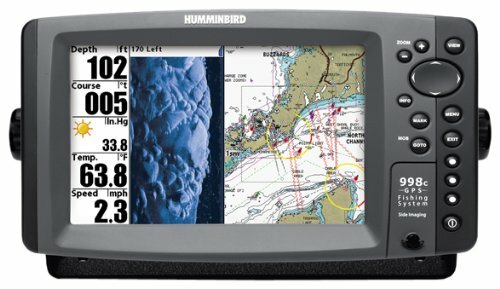 What are the top features of Humminbird 998c Si? 01. 8 inches LCD color display with HD technology. 02. It has Down imaging and side imaging sonar of 455KHZ. In 2019, Humminbird 998c Si is the best fish finder product you can buy in the market. It is already included the latest technology and more facilities than you expected from it. The cost is not so high, and a lot of people already trying this product. If you watch YouTube, you can find a ton of videos regarding good Humminbird 998c Si reviews. So there is no wonder why this becomes a trending product in 2019. If you are looking high-quality products for a fair price, then Humminbird 998c Si is the best for your purpose.